It's that time of the year again! Parades, barbecues, picnics, and some good old fashioned family fun! No matter what the occasion, there is always an outfit for it. One of my fondest Fourth of July memories, is going to our local parade. Every year my family and I would sit in the same place, with the same people, under the same tree, on the same block. There is something to be said for consistency in one's life, it's like a security blanket, and although our families have moved away, and are busy with their own lives, my husband and I have carried on this cherished tradition, not sitting very far away from our original spot, holding on tight to the end of that security blanket, as we make our own memories. Do your plans for the fourth involve family traditions? I would love to hear how you will be creating your own treasured memories this weekend. 1. Crop top~ H&M / 2. Chiffon maxi skirt~Chicwish / 3. Wedge espadrille~C. Wonder / 4. Navy/white striped clutch~Urban expressions marina clutch~DSW / 5. Gauze printed sundress~C. Wonder / 6. Peep toe suede espadrille~C. Wonder / 7. Printed stripe mini bag~C. Wonder / 8. Top Shop cutaway crop top~Lyst / 9. High waisted denim shorts~Wanelo / 10. Sam Edelman Gigi limited edition sandal~Nordstrom / 11. Merona cross body bag~Target. 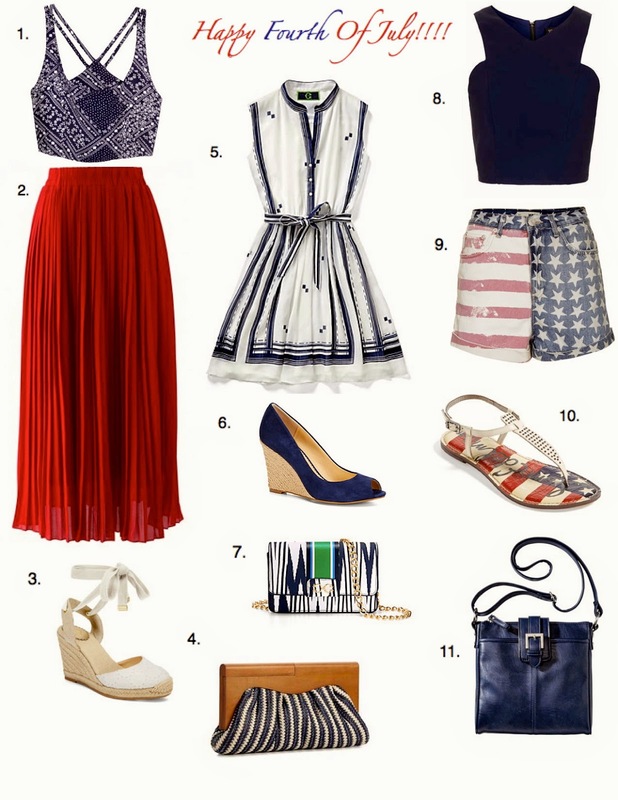 **Images courtesy of H&M.com, Chicwish.com, C. Wonder.com, DSW.com, Lyst.com, Wanelo.com, Nordstrom.com, and Target.com. Have Happy, safe and FAB Fourth!